Enlightened Christian Gathering’s (ECG) Apostle Innocent Nyirenda has taken the country’s commercial capital by storm, attracting thousands of faithful to the church’s Sunday services. It is not the first time for the ‘prophetic machine’s, as he is referred by worshippers, to attract media attention for his ministerial work. 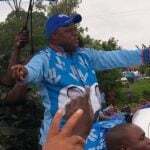 Before, he got media attention for shaking Mzimba district with his accurate prophecies and divine healings. He told Nyasa Times in an interview on Monday that the manifestation of God’s hand was at work. “I have been humbled by the power of God. He has immensely blessed us with so much, and I am sure there is more that is in stock,” said Nyirenda. According to him, he would not have been where he is without the help of his spiritual father Major 1, Prophet Shepherd Bushiri. “He is a great man of God who has mentored me to where he is,” he said. Nyasa Times learnt from some people who worship at the Blantyre branch that Nyirenda performs just like Bushiri. “He is a powerful man of God. I am always moved by his services,” said Martin Bwanali from Machinjiri in the city. And, Nyirenda said that because of the huge turn-up to the services they were planning to relocate. “We are in fact trying to relocate to a bigger space. Something like Robins Park,” he said. Apa vuto ndi lakuti, anthuwa samawerenga mawu koma akufuna instant results to their zosowa. wake up abale ndi alongo. Kubwera kwa Yesu kwayandikira. Ino ndi nthawi yoti tikonze khalidwe lathu while we are still here on earth, khalidwe lathu lifnane ndi la Yesu popeza that is the only character that will be accepted to those that will make it during the second advent. Iweyo zochitazako umafanana ndi Yesu ukueeluza azako Yesu samaweluza mwalephera kufanananaye Zikomo. Like father like son. We are blessed whether one likes it or nor. Holly Spirit is at work 24/7.Mudzafikeko ku Lilongwe bwaaa? ?